Residents fear a gentrifying path of condos will erase the ‘heart and soul’ of Vancouver’s Chinatown. Suelina Quan and Larry Chan's heritage house at 658 Keefer St. represents the survival of the Strathcona neighbourhood in which it sits, as well as neighbouring Chinatown. Mr. Chan is the son of Mary and Walter Chan, who were two prominent activists that fought the long, hard battle to save their neighbourhood from the city's urban renewal program of the 1960s and early 1970s. The urban renewal trend saw the demolition of low-income neighbourhoods, regarded at the time as "blight." Programs were under way to replace old, low-income neighbourhoods with infrastructure and big, new public-housing projects. A complicated eight-lane freeway was set to replace Vancouver's Chinatown. The house at 658 Keefer was set to be expropriated and demolished, but Mary and Walter and others mobilized the community and helped quash the freeway plan, turning Strathcona and Chinatown into two of the most livable and diverse neighbourhoods in Vancouver. 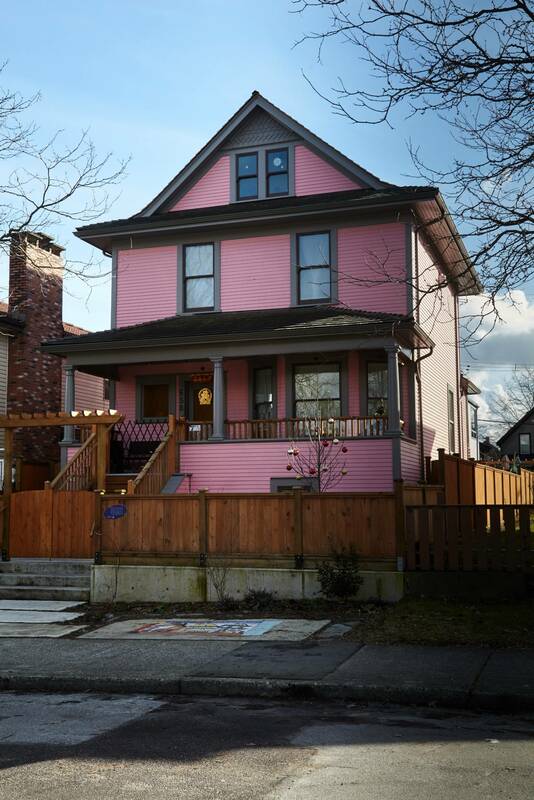 The area is again under threat – and the community is mobilizing again to save it – which makes the house's inclusion on the Vancouver Heritage Foundation's 15 th Annual Heritage House Tour Sunday especially meaningful. "This house was due to go down, and people were saying, 'it's too late – the freeway is slated to go in,'" Ms. Quan says. But Mary and Walter and others formed the Strathcona Property Owners and Tenants' Association and ultimately saved the entire neighbourhood. In the early 1960s, as the first phase of the transition, parts of Strathcona had been demolished to make way for a public-housing project. Nearly 1,000 residents were relocated, similar to the way low-income Little Mountain residents were relocated after the province sold that public-housing project to a developer nearly a decade ago. Planners had failed to recognize that the district of fishmongers, produce sellers, BBQ restaurants and houses packed with extended families was a happily thriving working district and residential neighbourhood whose members had strong, established ties. Without the community opposition, the area would most certainly have become a dead zone. Instead, it became walkable and livable, and in 2011 was designated a National Historic Site. Mary and Walter's legacy is not lost on the younger generation that is embroiled in a new, equally fierce battle to save Chinatown. This time, the threat is not a freeway, but a gentrifying path of condos. Instead of urban renewal, it's now in the name of urban revitalization. Activists argue that this plan also fails to recognize the significant social and economic ties of a community that will only be hurt by the current symbol of progress – the bulky condo tower. For many, it's become the new freeway. The Beedie Group's proposal for a 12-storey, 110-unit condo project at 105 Keefer and 544 Columbia has become the proverbial lightning rod. The developer is seeking special rezoning to go to 120 feet in height, which many feel would be an imposing and ill-fitting building for a culturally significant intersection. The site, currently an empty lot, is next to a memorial dedicated to Chinese-Canadian labourers. Across the street is the esteemed Dr. Sun Yat-Sen Classical Chinese Garden and the Chinese Cultural Centre. In preparation for the tour on Sunday, Ms. Quan has placed black and white photos of her in-laws around the house. Walter's columns for the Chinese community newspaper are still remembered by local seniors. Mary and Walter are still highly regarded. A photo of the Chan family in front of their Srathcona home. "I was standing at the Dr. Sun Yat-Sen garden at the Moon Festival, and I don't think there will be that festival if that building goes up, covering the sky," she says. "My feeling is the building is not going to service the community. Few will be able to live in there. Chinatown is struggling to stay alive." With downtown completely built out, the traditionally working-class neighbourhood has become a target for development. The city has embarked on a mass rezoning plan to encourage more residential development. Two bulky developments at Keefer and Main resulted, and have been widely derided as out of step with the mom-and-pop feel and charm of the neighbourhood. Beedie Group is seeking special rezoning for the site to allow an extra three storeys. In exchange, they are offering 25 units of low-to-moderate-income housing for seniors. The seniors would be housed on the second floor, above a retail level that could include bars and restaurants. The proposal also offers Chinatown groups a 10-year lease on a cultural space. BC Housing would fund the seniors housing, and only one-third would be truly affordable, says urban planner and adjunct professor, Andy Yan. He also sees the seniors housing as acting as a noise buffer between the ground-level retail space and the expensive condos above. "The question is, does this project deserve the additional height and density?" he asks. "Remember this is a rezoning, not a development application. It's not as if this [developer] is kept from developing the land. He could build outright to 90 feet, so long as he stays within the design guidelines of Chinatown. That's important to note. "It's the perversity of the Vancouver real estate market, where seniors' social housing is being used to justify three stories of luxury penthouses. And the accompanying rezoning could actually destroy more affordable housing than it creates. "It completely increases the surrounding land value because there will be those who will say, 'now I can build to 120 feet.'" A recently released city memo says that it wants to maintain culture and character in Chinatown. And yet, those spaces already exist, Mr. Yan says. What the area needs is truly affordable housing for its low-income population, not luxury condos. "If the city wants social connectedness, it is already there. You grow it – you don't stomp on it with 120 feet of high-end condos." There is also the question of why taxpayer dollars should help fund a developer's profit margin. The battle to fight the project has the community in an uproar, packing several public hearings at City Hall in the past two weeks with around 240 speakers. It's also created division within the community. A petition signed by 2,567 people asks government to acquire the site and develop it for low-income housing. Another petition signed by 1,075 people supports the proposal, saying it will "bring numerous community benefits." Council will make a decision on June 13. Shirley Chan spoke out against the project, as she did when she was 22 and fighting the freeway project alongside her parents, Mary and Walter. The Chan family seen in 1968, from left to right: Larry Chan, Mary Chan, Karem Lam, Nick Lam, grandmother Lim Hop Lee, and Walter Chan and Shirley Chan. Ms. Chan played a key role in saving Chinatown from the freeway plan. At the time, the city needed federal funding, so federal minister for transport and housing, Paul Hellyer, came to town for a tour of this "blight" neighbourhood. Ms. Chan crashed the tour, and, seated next to the minister, she gave him her own perspective on Chinatown. She pointed out the houses as solid structures, and let him know that her community was despairing over the loss of their homes. That day, Mr. Hellyer announced a freeze on funding for urban renewal. This time, Ms. Chan wonders if anyone in government is truly listening. "Council has been good about approving whatever the developers bring forward, once the staff has put forward their recommendations … whether it's the West End or in Grandview Woodland," Ms. Chan says. She blames the city's revitalization plan for "the mess." "We were persuaded the only way to save the Chinatown economy was to get more people on the street. We hadn't thought about the downside, which was increased property taxes, development pressure that then applied to the entire area or the loss of the older, traditional buildings. "It's not Beedie's fault. This is our mistaken, badly done rezoning." Former premier Mike Harcourt was a young lawyer who helped fight the freeway alongside Ms. Chan. "We got through that [battle] just fine, and we were able to turn Gastown and Chinatown into two heritage areas. "It was basically the pilot project for changing the federal, provincial and municipal thinking from urban renewal and freeways to citizen engagement and neighbourhood improvement. A livable-city idea. "And now you've got this battle for Chinatown's heart and soul, and what's appropriate in scale, and how to do it properly. To do a rezoning on top of a rezoning is not the way to go," he says. "I'm not sure why the city doesn't just turn it down and say, 'build to scale.'"